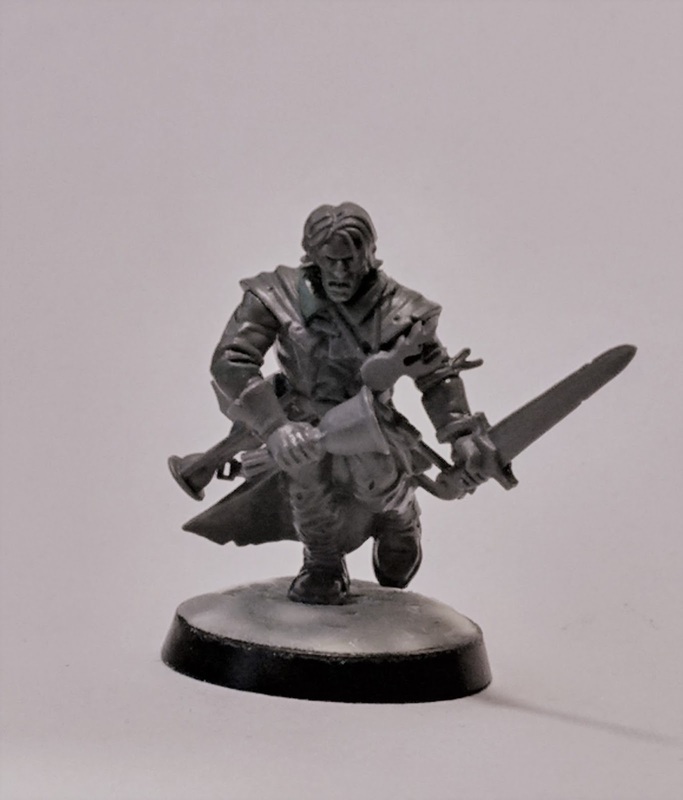 The rise of the witch hunter in the Mortal Realms came out of necessity at the beginning of the Age of Chaos when the isolated settlements of man needed champions armed with both the knowledge and weapons to fight the dark forces of the ruinous powers. Indeed, the term ‘witch hunter’ has become something of a misnomer considering their foes include not only witches, but also the predations of daemons, cultists, rat men, the various forms of the undead and a thousand other cthonic entities that have risen in the apocalypse. Neither was it just individual hunters that answered the call in defense of the Mortal Realms, but rather, as the millennia passed, whole family dynasties of hunters came to be. Relying on the foundations of wisdom from their ancestors, certain hunter bloodlines became infamous across all eight realms, each family armed with their own weapons, knowledge and creed. Indeed, each realm can be said to have influenced each family in the ways they wage war against their enemies: those in the realm of Shyish utilise bells, those in the realm of Hysh use mirrors and captured light, those in the realm of Aqshy wield weapons of purified flame, and so on. Nor is the knowledge base universal amongst the dynasties for each often hold massive libraries filled with unique tomes of lore reflecting their individualistic creeds. For some are more than willing to utilise the blasphemous magicks and weapons of their enemies against them, whilst others are staunchly against such a practice; citing reasons from the robustly pragmatic to the fervently dogmatic. Similarly, not all families are solely devoted to the grace of Sigmar, but will often call upon the forgotten gods of order (and sometimes to other deities or pantheons of a more ambiguous alignment) for aid in their works. Jovan Voortdurend belongs to a fractured bloodline of what is often referred to by the other dynasties as a “Ragged House of Vagabonds”. Despite his acerbic nature, his tattered demeanor and his ‘whatever it takes’ attitude to his work, he is an incredibly proficient hunter. Armed with a vast pool of knowledge and variety of esoteric weapons, he earns very few friends amongst his peers for his creed, but his results cannot be argued against; even if most say he walks a dark path and is bound to fall off the edge soon enough. Great! I like both the mini and the background. Excellent conversion! What bits did you use for the body? Emotive text for a visually intriguing character . Wonderful ! To be honest, I know Jake has a bee in his bonnet about DAoS centring around witch hunters (and moving far away from the yawnfest collection of Stormcast), so I pulled this together to fit more comfortably in the new setting. Making them a little more like their 40k Inquisitor counterparts and less like the puritanical Sigmar KKK wannabes of the Old World (although they're still an option if you want). I do get what you mean though as I am also very fond of the surrealist and absurdist motifs, and that whilst AoS is a new blank canvas, GW have gone very Hellenic with it so far. ;-) when I saw those bb guys all I could think of was judges with those heavy eagles pauldrons or arbiters ..i look forward to seeing those. Humour is often overlooked with the hobby I think in fear it may return to the slapstick days of yore.. But I have always thought there is small place for it .. Particularly black comedy or absurdist stuff as you mention. But then I am a great big fan of the late Douglas Adam's brand of surreal sci fi. 2000ad was full of scathing satire too. Yeah the age thing is relevant I often feel I should be the one championing oldhamner.. Instead of Inq28 but I feel that there is a focus more on collecting expensive rare models, and I am not really a collector .. I often feel at odds with the those around me because of it tbh. My era was surrounded by the birth of the more well known skirmish games (Necromunda, Mordheim, Gorkamorka, Inquisitor), so I've always championed them as opposed to oldhammer in general.